I meet when Mother reads aloud. I scale when Mother reads aloud. So simple to be true. My eyes, when Mother reads aloud. It wasn't a bad read-aloud week here. Finally. We were due in for a good one. Connor & I are halfway through Peace Child, and hopefully past most of the graphic cannibalistic descriptions. It's been fun making connections with other things we have read (like Torches of Joy). We got through almost half of Hittite Warrior. Mostly that is for William and Thomas, though others are listening in some. Trina could not care less. Hittite Warrior takes place in Canaan in the time of Deborah. We read it aloud a couple of years ago, but for whatever reason, William and Thomas aren't really remembering it from then. Haven't done nearly enough with the little two. 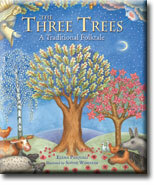 Read The Three Trees aloud a half-dozen times. And reviewed it earlier this week. Read some titles from the library... most are the fault of other Reading Aloud Challenge participants! Thank You, Mr. Falker, a title I need to read every few months. The Apple Pie Tree. My Mother is Mine. Plans for this coming week? Finish Peace Child with Connor. Finish Hittite Warrior and get going on God King. Read Mountain Born to the younger two. You make me feel lazy! Loved the poem. I think I will read aloud this afternoon even though I canceled school in honor of my dental appointment! I am glad your week went well! I have been rather lazy this week, using Librivox for some of our read-aloud time. I probably should have begun the more interesting picture books on the same topic and covered them first. But, nope, felt lazy and went for the easiest first.